There’s an urban legend among Dota 2 players. Whether they refer to it as “the Trench,” “Elo Hell” (after the Elo rating system originally used for chess) or “Forced Fifty”, people tell each other tales about playing in a sort of inescapable matchmaking abyss, of having some of the most frustrating games of Dota 2 a matchmaking system can provide. Players fall into the Trench and can’t escape it. Like a boogieman stalking Valve’s matchmaking servers, once the Trench has you, it’s hard to shake its grasp. 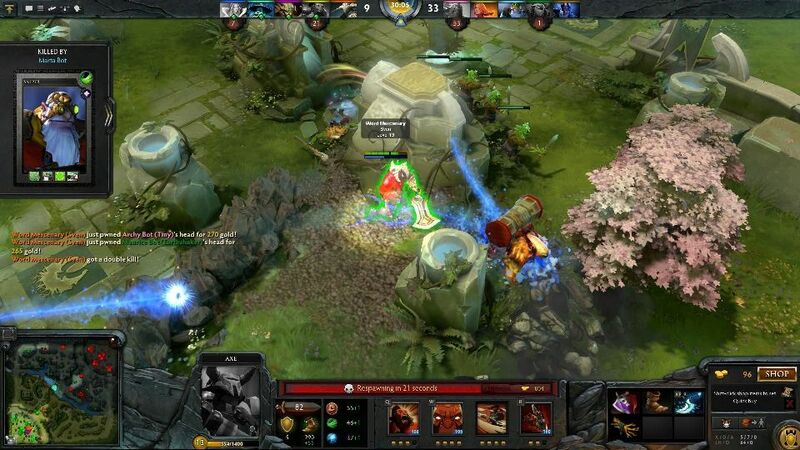 To understand the Trench you have to understand how matchmaking works in Dota 2. Valve determines your relative Matchmaking Rank (MMR) by assigning points to you whenever you play a game. There are exceptions, but usually when you win, you gain points, and when you lose, you lose points. The matchmaking will attempt to match you with players who share a relatively close MMR. When players are just entering the world of ranked matchmaking, they gain and lose several more points per match as the game calibrates them to the appropriate skill level. (Valve refers to this heavy fluctuation as “uncertainty,” and it’s meant to get good players to higher ratings faster and keep average players where they are). Ideally, after a number of games, you’ll be matched against people who share your skill level, making for better and more equally-matched games in the long run. The Trench is a theoretical aberration in this system, where a player is placed in a skill bracket in which they do not belong, usually putting them somewhat below their skill level. Normally, this wouldn’t be a problem—just play more, do better and eventually they’ll get to where they should be. But Dota 2’s a team-based game, and because of this, the crux of the Trench is the idea that one player cannot win the game for his team. Players who believe the Trench exists often assert that their MMR is lower than it should be (due to some error during the early stages of their career or during the calibration stage), but that because they’re consistently matched up with players decidedly worse than them, they lose games they shouldn’t. Their teammates burden them to the point where they can’t pick up the slack, and because they’re unable to win consistently, they stay at their current rating forever, losing as many games as they win and doomed to be matched up with people who will drag them down and prevent them from getting into their appropriate MMR. The Trench comes up endlessly on any Dota 2 forum or thread. People post stats for games where they were clearly the best player on a losing team, cite the wonky or misguided items and skill builds of their teammates, and just attribute it to the Trench losing them games they should have won. Occasionally you’ll read debates about whether the Trench actually exists or not, but like the Trench (and most arguments online), they tend to be cyclical. It’s also difficult to peg just where the Trench lies, rating wise. Though the average rating for most players who play Dota 2 lies around the 3000-3500-range, players far lower and higher tend to find themselves in the Trench, making it difficult to suss out just where the Trench is. Regardless of where the Trench may be, however, many state that if they could just start the calibration stage over or suddenly have an account with a higher MMR, they would be able to properly compete and attain their “true” rating. Juice, a high-level player (about 5600 MMR) on the PlayDota forums, decided to test whether the Trench really existed. To do this, he requested a 3000 MMR account that had already undergone calibration from someone else on the forums, and experimented to see if he could get out of the Trench simply by being far better than the rest of the people around him. The account he eventually got was rated around 2900, and he aimed to take it back to the lowest point that his own account has reached in ranked matchmaking (5400). Keeping in mind that because the account had already been calibrated, Juice would only receive about 25 points per win (and would lose 25 per loss), so he would have to win far more consistently than most players at 2900 in order to climb up to 5400, which would mean that a player who is far better than the people around him should be able to reliably raise his rating out of the Trench. Juice did what many believers of the Trench thought was impossible: He singlehandedly won games for his team. By picking heroes who don’t rely on team play to gain an early advantage in gold and levels, Juice was able to take control of just about all the games he played at the 3000 level. It was only after he started closing in on his main account’s rating that he began having any issues outplaying the entire enemy team. If the Trench gave Juice teammates with qualities that Trench believers often bemoan (dying too often for no apparent reason, buying the wrong items for their character, and overall poor decision-making), it didn’t matter much. Juice recounted that many of the mistakes that players make at the 3000 and 4000 levels are widespread, and while many players express frustration at how their teammates play, he noted that more often than not those same mistakes happened on the opposing team as well. You’d think that in the stats and tech-driven world of online multiplayer games, a result like this would prove Juice’s point. But like so many superstitions, belief in the Trench is persistent. As people began to question the validity of the results of the experiment, Juice’s skill level was actually used against him. Because he was so much better than the people he was being matched up against on a 3000-level account, it was obvious he was going to fly through the ranks. But what about players who aren’t good enough to completely wipe the floor with their competition? So part of what makes the Trench work is that your MMR changes after every game. Because of the nature of matchmaking (and the natural deviation towards the mean), you’re bound to go on winning streaks where you climb through the ranks, then get knocked back down in a losing streak. A player who’s on a winning streak might interpret the streak to them suddenly getting better, then be baffled by why they suddenly lose a few games in a row. There’s also the other part of the Trench theory: If a player could just leave their Trench, they would thrive and have much better games. So what happens when you pair someone with an account far above their current one? Luckily, we have a test case for this as well. Zerrax (also from the PlayDota forums), a roughly 3500-rated player, bought an account rated at around 4700 and attempted to see if they could hold their own against opponents at that skill level. Could they hang? Sort of. Though their game history shows that the account’s overall win rate is just over fifty percent, Zerrax took the account over back in early March, and you can see a clear difference: Their record after taking over is, as of this writing, 60 wins to 73 losses (about a 45% win rate). Though Zerrax’s performance isn’t as poor as some other accounts that have gone through similar changing of hands (it seems that there’s a bit of a market for people who work accounts up to around 4.5 or 5K and sell them to lower-tier players), their scoreboards aren’t looking too great. Numbers rarely tell the full story in a game like Dota 2, but Zerrax hasn’t had too many games where they performed above the rest of their team. In Zerrax’s case, it’s the team aspect that skews their results—by playing a supporting role, one that tends to have less impact than other roles in matchmaking, they’re minimizing their role in the game to some extent, and letting their teammates do the work and pick up the slack. In short, Zerrax is not performing at the level they should be. These two experiments show that, for the most part, Valve’s matchmaking is working as intended. Juice had no trouble getting to his appropriate rating, and though Zerrax may not have dropped down to their’s, they’re likely learning quite a lot about the game through the trial-by-fire of playing at a much higher level and keeping their impact on the games they’re playing relatively low. It’s hard to imagine that the Trench exists. More likely, it’s fueled by a combination of Dunning-Kruger and cognitive bias. Players who believe in the Trench likely have a low locus of control, and believe that losses “happen” to them. They may not have the self-reliance to assume the role of the person who’s going to lead the team to victory. Of course, they always like to feel as though they contributed to the victories of their teams, so they tend to gloss over games where they may not have had much to do with their team winning. When you’re at the appropriate ranking and you’re winning around half the time instead of rising up, that’s not a quirk—it’s arguably the intended result. Juice and Zerrax have proven that if you want to work your way up the ranks, you have to play a team-based game with as much self-reliance as possible (there’s probably a life lesson in there somewhere as well.) Still, for those who believe in the Trench, experiments like this aren’t likely to dissuade them from believing it exists. The Trench, as much as it’s feared, is simultaneously a comforting thought for players who don’t see themselves improving: They’re not plateauing, they’re just unfairly stuck in the Trench. If it didn’t ultimately help assuage its believers as much as it seemed to bother them, it wouldn’t be a superstition. Suriel Vazquez is freelance games writer and critic based in Omaha, Nebraska with a solo MMR of 3039, but it’d be way higher if it wasn’t for that Sniper player who built Assault Cuirass that one time. You can follow him at @SurielVazquez.